SsangYong is South Korean domiciled and Indian owned with its UK headquarters at Luton Airport. It is also the shirt sponsor for the local League Two team, Luton Town. The summary is normally at the end of a report. I have reversed in this review. The car was far better than the football match. The Colchester Community Stadium (2008) looks very modern and inviting but does not have the corners filled in. Late March the wind is unpredictable and cold. What it must be like during the depth of the winter must be awful. At least the footballers get paid to perform and whilst the hospitality was fine and the parking easy I for one will probably not be rushing back next season. The match itself was awful Luton losing 2-1. There are currently some 60 SsangYong dealers across England, Scotland, Wales and Northern Ireland and all models are covered by a best-in-class five-year limitless mileage warranty. The Korando is a competitor for the Nissan Qashqai, Hyundai Tucson and Kia Sportage. The Ssangyong costs considerably less than the entry-level versions of its competitors. The test car was the basic manual, brand new, and without the essential, I believe in these days, Sat Nav and reversing camera. 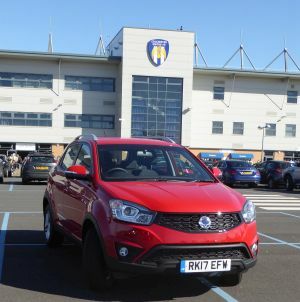 These bring the total list price up around £17,750 in two-wheel drive form, extremely good value for what is a robust family car ideal for those whose motoring includes the use of countryside venues with traction problems. It can also be used for towing, a real plus for some. As with all SUV’s you really do look down on your contemporaries, the small family cars that prevail. It must be safer seeing all around from the high vantage point. On the minus side it is a climb up not only for the driver but also for small children and other less mobile family members. 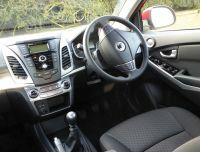 With the Korando it is wider than many of its rivals, which means you can genuinely fit five adults inside. 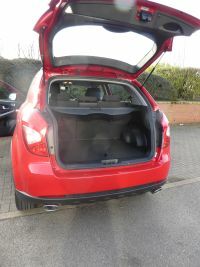 A flat floor means the rear leg room is very good and tall people will find for most the head room is OK. With a large boot, and virtually lip no loading is easy. With the seats folded down it is not quite van size but most large items will fit. There is also a fixed roof rack for the seriously overloaded types. 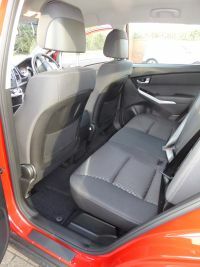 Even this entry-level SE models was well equipped with air-con, alloy wheels, keyless entry, front and rear electric windows, cruise control and Bluetooth connectivity. The gearbox was notchy but since I started with just 10 miles on the clock it was bound to free up, and 350 miles later it was easy to find one’s way around. With a 0-60 time of just under 10 sec the Korando is average to quick in its class and has a top speed of 115 mph. At 70 mph cruising the silence is more akin to the very top class car of a few years ago. Don’t expect the Korando to live up to its ‘sport’ moniker but you can charge into a roundabout, break a little a late and not withstanding a little body role be ready to charge out of the required turnoff. It is not, and does not pretend to be a ‘fun can’ but is very adequate if you need to motor quickly. It was a dry weekend and therefore I have no comment to make of its handling in the wet but on dry roads the Korando seemed very sure footed. There is height adjustment on the driver’s seat and adjustable lumbar support, too. Often with a test car the control layouts are a pain with nothing placed in the normal position and little time to find out where all the controls are placed. Not so with this car, the interior laid out in a sensible manner. It is all traditional with a handbrake where it should be, just behind the gear change. With the choice of two-wheel or four-wheel drive and a two-tonne towing capacity, Korando offers the practicality of a 4x4 SUV, the accessibility of a family hatchback, and the capability to go from muddy campsite to urban school run. There are three models available, with the option of six-speed manual and six-speed automatic transmission.